At first glance, it’s hard to see what the renowned operatic mezzo-soprano Blanche Thebom, whose turns as Fricka, Carmen, and Amneris defined those roles for half a century, has in common with the kindergartners playing xylophones in Lori Adessa’s music class. Ms. Thebom died in 2010, at the age of 95. She was one of opera’s great divas, with a presence friends and colleagues describe as “grand,” “elegant,” “bold,” and “graceful.” Her voice was dark and dramatic, a “glorious sound,” according to Jason Serinus of San Francisco Classical Voice, and she sang for more than forty years on the stages of Europe and America. But as passionate as she was about performing, she was equally as passionate about teaching. A practitioner of the true bel canto style, Ms. Thebom – “Miss T” to her students — taught the technique well into her ninth decade, to hundreds of students over her lifetime. But she also believed wholeheartedly in the importance of a musical education for all children, and therein lies her connection to the five-year olds sitting on the carpet around Lori Adessa. Although vocal training doesn’t usually begin in earnest until the teenage years, Ms. Thebom knew that musical expression and appreciation begin far earlier than that. In fact, she recognized decades ago what countless later studies have shown: that musical exposure has a profound effect on the growth and development of the young mind. Upon her death, the Blanche Thebom Trust was established to continue her work; to ensure, in the words of its trustees, that her “dedication to musical education will resonate for years to come in the voices and lives not only of her own students but also of students who are just beginning to sing.” In keeping with that purpose, the Trust recently funded Kiddo!’s purchase of 69 new musical instruments for the district’s music program, including five bass xylophones, a set of contra bass bars, dozens of African drums – and the alto xylophones that Lori Adessa’s students are playing. It’s hard to overstate the difference these instruments have made. In recent years, the district’s instrument collection had become stretched to its limit: many were over thirty years old, and they were spread increasingly thin over a growing student population. Music teachers Lori Adessa, Anna Stearns, and Nora Thomas had to move drums, xylophones and other large percussion instruments from school to school for their classes, compromising their condition and intonation, and their students had to wait longer for a turn to play them as class sizes grew. But now, thanks to the Trust, there are enough instruments for each school to have a permanent collection of its own. There are also more of them for each class. 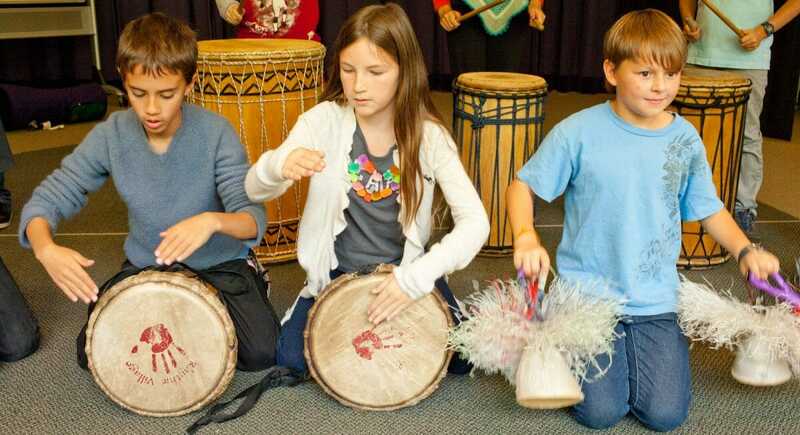 Anna Stearns, or example, now has enough authentic, handmade African dunun, djembe and sheke drums for every student in her fifth grade music classes on site at every school, where before, she had enough for only half, and had to lug them from one school to the next. This effectively doubles the amount of her instructional time, an invaluable gift, and reduces wear and tear on the instruments, which will prolong their life. Moreover, as Lori Adessa’s kindergarteners could tell you, the instruments’ value extends far beyond the practical. For the past few weeks, they’ve been playing their new alto xylophones, learning to accompany themselves on a four-verse song. Now Lori brings out the new contra basses for the first time. Their pale mahogany wood gleams. Each one is half the size of even the largest students, and their presence instills a kind of awe among them. “Lie down,” she tells them, and they lie flat on their stomachs. She strikes first one contra bass, then another: a low note, then a higher one, the tones reverberating through the floor and into the children’s prone bodies. “Can you feel it?” She asks. They do; they wriggle on the ground in delight. Those are the sound waves, Lori explains. They are what music is made of. She tells them about high notes, and low notes, and how larger instruments make lower sounds and smaller ones, higher. They listen, and ask questions: is it like the big and little drums? The cello and the violin? Yes, she says, you’ve got it.